Jack P. Rawlins's study explores one of the great problems of mid-Victorian literature: the explanation and justification of William Makepeace Thackeray’s narrative style and structure. 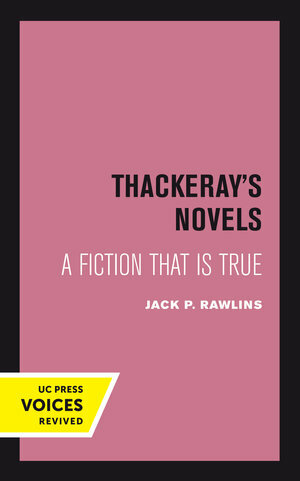 Rawlins finds that Thackeray in his novels of English society uses an exaggeratedly conventional plot structure as a means to comment on the condition of the novel in England. The frustration and fury that have traditionally been the response of the feeling reader to the excesses of Thackeray’s narrator are the result of a basic aesthetic conflict of which Thackeray wants to make us inescapably aware—a conflict between the dramatic action, which demands a commitment from us, and a narrator who feels that the commitment has been thoughtlessly made and who seeks to turn our attention to the didactic uses of the novel, to the lie of the realistic, and to other aesthetic and moral issues. Treating The Newcomers, Vanity Fair, The Virginians, and Philip in detail and the other works in the canon more briefly, Rawlins locates Thackeray directly astride the most serious aesthetic problem of his age: the status of fiction and its proper employment. This title is part of UC Press's Voices Revived program, which commemorates University of California Press’s mission to seek out and cultivate the brightest minds and give them voice, reach, and impact. Drawing on a backlist dating to 1893, Voices Revived makes high-quality, peer-reviewed scholarship accessible once again using print-on-demand technology. This title was originally published in 1974. At the time of original publication, Jack P. Rawlins was teaching English at California State University, Chico.